Sailing through largely unexplored reaches of the Pacific Ocean aboard a 134-foot ship for six weeks might not float everyone’s boat. But for FGCU senior Alex Miranda it was the adventure of a lifetime, an opportunity that provided hands-on experience few peers will be able to match. Alex Miranda at the helm of the SSV Robert C. Seamans. 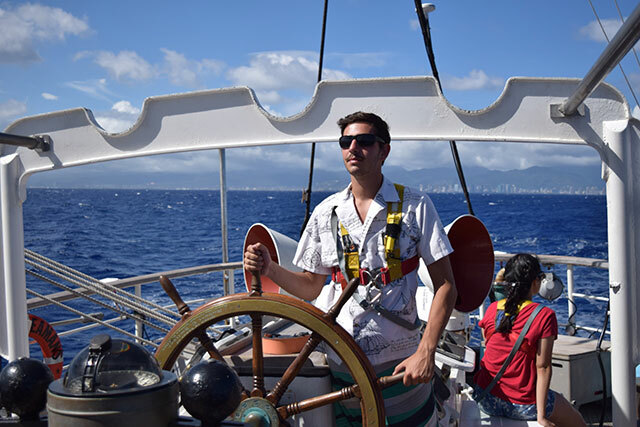 The environmental studies major from Jupiter was one of 23 undergraduates from colleges and universities around the country including Ivy Leagues chosen to participate in a rare summer research voyage. The Sea Education Association/SEA Semester, a Boston University-accredited program based at Woods Hole, Mass., selected the sea-worthy students to gather data on the health of the Phoenix Islands’ coral reef ecosystem and to recommend policy implementations to protect and preserve them. The little-studied Phoenix Island Protected Area, about the size of California, is one of the last remaining coral wildernesses on Earth and is the largest UNESCO World Heritage site. 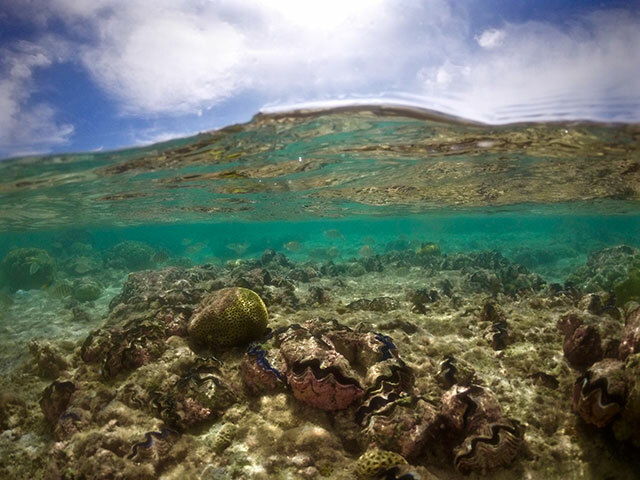 The marine biologists and students documented enough evidence to show that the islands’ coral reefs — which previous research dives between 2009 and 2012 had found devastated by overly warm water — are not just healthy but thriving and growing. The phoenix-like recovery was so stunning that it was reported in the New York Times. Miranda applied for the eight-week program after first learning about it through FGCU’s annual Study Abroad Fair. After getting accepted, he had to come up with about $20,000 through scholarships from FGCU’s U.A. Whitaker Center for STEM Education and the SEA Foundation and through personal fundraising to secure a place on board the brigantine SSV Robert C. Seamans. It’s the most sophisticated oceanographic research/sailing school vessel ever built in the United States, according to the Sea Education Association. Offered in partnership with the New England Aquarium, the program began with two weeks of preparatory coursework at Woods Hole, where students also developed their own research projects in ocean science or conservation policy to explore while they were at sea. From Honolulu, they began their 1,600-mile voyage to the Phoenix Islands, a mostly uninhabited chain of atolls where they studied the effects of El Niño, climate change and coral bleaching. Miranda has a minor in climate change. Seas could range from calm to 15-foot swells knocking passengers out of their bunks or knocking them out with seasickness — lightheartedly referred to as “battling with Neptune.” Far from any major port, with few other ships in sight for long stretches, could play with anyone’s mind but Miranda didn’t lose his head — or his lunch. He grew up boating, fishing and diving and attended the Jupiter Environmental Research and Field Studies Academy at Jupiter High School, so he was a little more prepared than some of his shipmates. Marine biologists and students documented enough evidence to show that the Phoenix Islands’ coral reefs are thriving. As for the potential psychological effects of a long stretch at sea, Miranda says credits FGCU courses such as “University Colloquium” and “Issues in Culture & Society: The Contemplative Life” for helping him stay grounded, to be in the moment and not take the experience for granted. Mornings, he sipped his coffee while watching the sunrise. His workday could start at 0100 hours with a six-hour watch shift followed by 12 hours off. A fairly constant light breeze of 6-8 knots and helped take the edge off steamy temperatures, blazing sun and sweaty labor like the weekly “heave to,” when the ship was brought to a stop for a field day and stripped and cleaned inside and out. Miranda can still conjure the greasy smell of the engine machinery deep in the keel, as well as the raw organic smell of the ocean life when the crew washed the nets used to collect biomass samples. The brigantine SSV Robert C. Seamans sailed to the Phoenix Islands Protected Area, one of the last remaining coral wildernesses on Earth. Another eye-opening experience was visiting Nikumaroro Island, also known as Gardner Island, an abandoned atoll where some speculate that Amelia Earhart crashed in her ill-fated final flight in 1937. Miranda took core samples from one of the archipelago’s few native trees, Pisonia grandis, a flowering species in the bougainvillea family and common roosting haven for sea birds. He mounted the samples to study the trees’ rings, a scientific method of dating called dendrochronology. 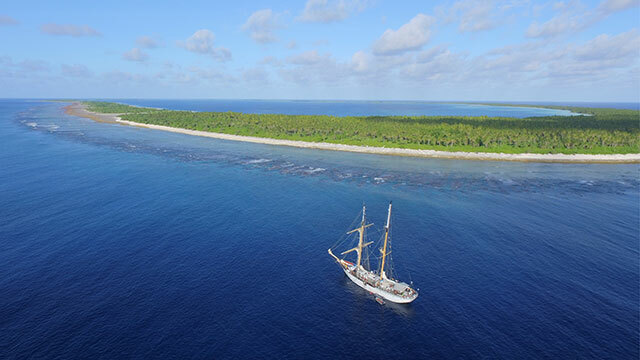 At the end of one day anchored off Nikumaroro, their last stop before sailing for American Samoa and then home, the research party returned to their tall ship and left the cay to its rightful residents.